Hello, it's finally Friday! Our kids and all the school districts to our North and East had a snow day today. We didn't get much snow, but the wind is blowing and they are predicting more snow over the next couple of days. The schools don't want to get them there, then send them home in the middle of the school day because so many parents work and they can't leave them off if no one is home, so it poses quite a problem and they end up closing the schools more often than they used to. Of course, our kids were in seventh heaven! 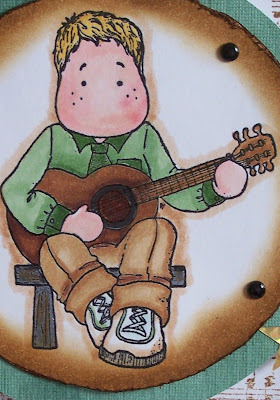 Today's card is a Magnolia stamp featuring Edwin at the Guitar! I have had this stamp for awhile, but haven't ever used it. He just does not get the same attention as Tilda. The Papers are from the Green Stack from DCWV. 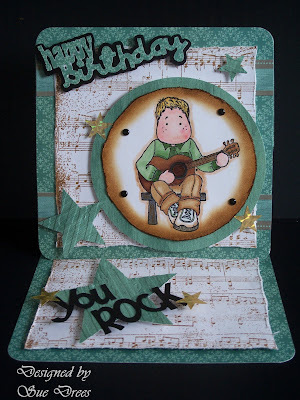 The green stars area Sizzix die. The words were created on the Cricut. Sue this card is perfect! You always come up with such fine cards! Love it! I find that I don't use my Edwin as much as I should...thank-you for inspiring me to do so! We had lots of snow here but the kids still went to school which surprised me a little! Boy do we need spring!!! Just gorgeous Sue - boys cards are always a bit difficult but you have rocked this one - must be an electric guitar - LOL. Rock ON! Sue -- you ROCK! I am just in love with this card - I recently visited Nashville -- and you've got Edwin just right! Oh lookie here, it is a hunka hunka burnin' Edwin and he's got me all shook up, that is for sure!! Now who do you think he is strumming to, Tilda or Willow or one of those Gorjuss hussies? Fabulous card, your colouring is always fantastic and I love those papers!! And of course, thanks for sharing with MDUC this week!! This is awesome, Sue! I love the beautiful green that you used. I can just hear him strumming that guitar! Stay warm, my friend!